An endgame play has a sente nature, if its follow-up is bigger than the value of preventing the sente play in the first place. Black is a move that has very small point value, but carries a threat of a much larger follow-up. If black plays , and white responds, white has 4 points, so preventing the move is worth one point. If black plays and white does not immediately reply, black can kill the whole white group. This is worth 20 points. Such a move is said to be sente against the white group, and because the threat is very big, the move is likely be sente even considering the whole board. The sente nature is very strong in moves that are "always sente". here has a much smaller follow-up than the previous example, so it is not necessarily sente when the whole board is taken into account. The follow-up (6 points) is, however, much bigger than the value of preventing (one point). 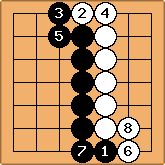 This means that as the game progresses, white will find it difficult to justify taking just one point in gote, while at some point of the game the remaining endgame elsewhere on the board will be small enough that white will want to respond to by capturing the three stones. In other words, because the threat is bigger than preventing the move, it is very likely that when the endgame is actually played, it is the sente move that will actually get played. A move that has a sente nature is not necessarily sente. There are at least two cases when this is obvious. The timing for the sente play is important. If the endgame elsewhere on the board is worth more than responding to the play, then the move was not actually sente. 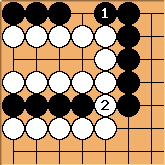 If black now saves the three stones in the corner, black has actually ended up in gote. If the opponent plays a move that carries an even bigger threat, then the move was not absolutely sente. Borrowing the example from basic endgame theory, the play at clearly has a sente nature, but white's best play is to force before defending?. In this kind of situations black will actually end up with sente, so might be called "sente, but not immediately so". When preventing the play is worth more than the threat, the position is gote by its nature. When such a move actually gets played, it is very likely that there are more interesting endgame plays elsewhere on the board, so the opponent will want to play an immediate reply. When the threat is equal to the value of preventing the move, we speak of an ambiguous move.